Sean Dyche felt there was a “lot to be pleased with” from his side’s performance, but he admitted it was galling to lose to an injury time Liverpool winner. Johann Berg Gudmundsson headed in his first goal of the season to cancel out Sadio Mane’s superb opener, but Ragnar Klavan headed in at the death to steal the points. 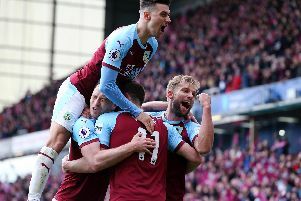 James Tarkowski made a return for Kevin Long after a three-game ban, but Burnley were otherwise unchanged two days after the goalless draw at Huddersfield Town. And Dyche was delighted with his players: “I think we’d done enough to earn another point. After about the first 15 minutes, when we didn’t really start well, we were good value for at least a point. “So we’re frustrated with a soft goal right at the end, but fantastic mentality from the players, we’ve gone with the same team, and a lot of noise is made about that, but you can see today, highly motivated, willing to give everything, superb physically, tactically very good again, particularly defensively, so a lot to be pleased with. Mane’s opening goal came out of the blue, and looked to be the winner before Gudmundsson’s late intervention: “It was a bit of a lucky break, it hits Charlie (Taylor) before it spins to Mane, but it’s a great turn and finish. “A lot of noise will probably be made about two players missing (Salah and Coutinho), but four out of the front five moved for £28-plus million so they still have some power and good players. “You have to be mindful of that, but I think we have a very good performance, particularly second half, we mixed our play well - good pockets of technical play, good pockets of ruffling feathers, making it uncomfortable, and created enough to score a goal, which we did, and a good sniffer’s goal from Johann.